BUFFALO – A year ago, as Martin Biron spent the 113-day NHL lockout at home in East Aurora with his wife, Anne Marie, and four small children, the popular former Sabres goalie began seriously thinking about his post-hockey life. Biron enjoyed attending all of his children’s activities – cheerleading competitions, football games, school events – something he couldn’t do while tending goal in the NHL. The family time “made me realize all the things that you miss,” Biron said by phone Wednesday, three days after announcing his retirement. When the work stoppage mercifully ended and Biron resumed his gig as the New York Rangers’ backup goalie in January, his family stayed behind in Buffalo. 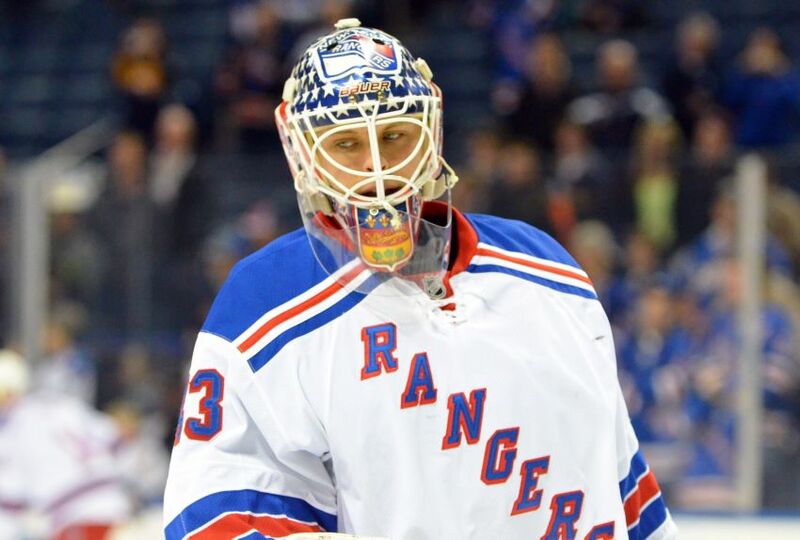 “I feel like I went to New York and a small part of me stayed back here at home with the family,” Biron said. In September, however, the 36-year-old experienced a different feeling. Biron, a former starter who became a top No. 2, began his 16th NHL season earlier this month. But San Jose blitzed him for five goals during an Oct. 8 relief appearance. Four days later, he was yanked from his start in St. Louis after 40 minutes, his final NHL game. The struggling Rangers waived Biron last week, then gave him time to decide if he would report to their AHL affiliate in Hartford. Having played so long, Biron knew he could get let go. He had discussed his future with his family and friends long before the Rangers waived him. Still, Biron took several days to mull his future over. “I wanted to make sure I made the right decision,” he said. “I feel really at peace with my decision,” Biron said. Make no mistake, though, Biron still enjoyed hockey. So far, the congratulations the loquacious Biron, whose personality and warmth are legendary, have been “amazing,” he said. Broadcasting, he acknowledged, could be in his future. He’s so talkative, honest and insightful networks could fight over him. He might try to “get on the ice” with some local teams, too. The Sabres made one lineup change for their 5-2 loss to the Boston Bruins inside the First Niagara Center, scratching defenseman Jamie McBain and inserting forward Kevin Porter. They dressed seven defensemen Saturday. Meanwhile, Patrick Kaleta is six contests into his 10-game suspension for hitting Columbus’ Jack Johnson high. NHL commissioner Gary Bettman could issue his ruling on the winger’s Monday appeal today.